Is Sage 50 the Best Business Accounting Software? Each business has its own unique set of goals and challenges. That's why Sage 50 offers a variety of solutions with your business' specific needs in mind. 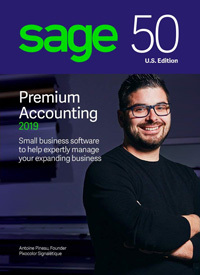 Whether you're just starting a new company or have multiple locations and many employees, Sage 50 has the best business accounting software for you. Each year's updated version of Sage 50 Accounting Software has benefits and features not found in the competition. With Sage 50 you get advice and tips that change with your needs. You get tools that help you make faster, better business decisions. With Sage 50 (formerly Peachtree Accounting) you get exactly what you need to fully realize your business vision. New Sage 50 accounting software customers get one year of free Sage Business Care1 with purchase. With access to our US based customer support, free product upgrades and more you spend less time, effort, and money on the operation of your business. You also get the security of knowing there's always a Sage Business Care support professional just a phone call or mouse click away. Whenever you have questions or need guidance, Sage Advisor Technology is there to provide answers and advice � 24 hours a day, 7 days a week, online, anytime, anywhere. Sage Advisor answers questions you didn't even know you had. What other business accounting software tells you which customers to target? Or can identify your best opportunities for profitability? Sage 50 Intelligence Reporting2 seamlessly integrates with Sage 50 and Microsoft Excel so you can get customized reports and analyses of your real-time data. Intelligence Reporting is takes the guesswork and anxiety out of making tough business decisions. It gives you dramatic insights into your business so you can innovate, streamline, and make effective, profitable choices. No business can afford to lose money to fraud or accounting errors. Sage 50's Internal Accounting Review3 uses 15 different data checks to find accounting errors, common mistakes, and suspicious transactions. You can also specify users' security levels down to the screen level then use the Audit Trail to track who enters or edits data, or who accesses a specific function. Only the best accounting principles are used in Sage 50 software. Just because you aren't a CPA doesn't mean your business shouldn't follow the accounting industry's best practices. Sage 50 uses double-entry accounting which is more accurate than other methods and creates more trustworthy financial reports. With Sage 50 software you have easy access to information that helps you in your everyday business life. With Sage you can improve customer service, be more proactive, and make better business decisions. Sage 50 provides informative management centers and dashboards. These give you an overall view of critical business metrics and the ability to drill down to the details. Because each center is customizable you can see the most important information about your specific business. Sage 50's inventory management helps you make fewer errors and controls costs. You can create and track inventory by any attribute such as color, size, style, etc. When inventory is entered on a sales or purchase order, Sage 50 automatically puts that product on reserve in your inventory counts. You can even setup inventory monitoring to prompt the automatic creation of a purchase order when inventory drops below your specified count. Any job related questions you have will be answered in the Job and Project Management Center. Use Sage 50's advanced change order tracking system so you can see how job changes will affect overall profitability. It lets you track estimated revenue and expenses down to the phase and cost code level, which are completely customizable to fit your company's specific needs. The Order Process Workflow lets you track each step of complex jobs and even lets you notify the next person in the process with the job's status and notes. Along with Inventory and Jobs, Sage 50 accounting includes a number of robust Dashboards and Management Centers. You can fully manage your customers, vendors, budget, cash flow, and overall business status. With quick access to every aspect of your business you save time and money with accounting software from Sage 50. It doesn't matter if you add employees, expand your inventory, or diversify your business � there's a Sage solution for you. Which accounting software is right for your business? Check out this Sage 50 software feature comparison chart. Sage 50 seamlessly integrates with a variety of other services, software, and third-party add-on solutions. This makes it easier for you to do critical business tasks like accept credit cards, perform online backups, pay employees with direct deposit and more. Sage is automatically integrated with the Microsoft Office programs like Excel, Word, and Outlook®. Sage 50 is easy to use and adapts to your needs. It makes running your company easier and more efficient, saving you time and money. Sage 50 truly is the best business accounting software. Call 800-339-8224 or contact CBA to buy Sage 50 today! 1Credit card required to activate service. To ensure continuous service, your Sage Business Care plan is an automatically renewing plan and subsequent years will be automatically billed to the same credit card each year on the anniversary date of your purchase at the then current rate after notifying you 30 days in advance of your anniversary date. You may terminate the plan with at least seven calendar days notice prior to your renewal date and not be charged for the renewal. 2Additional fees required. After a sixty day free trial, the service is available with Sage 50 Pro Accounting 2014 and higher; included at no additional charge with Sage Business Care. 3Sage is not liable or responsible for any fines or penalties that may result from errors in your company accounting records. The Internal Accounting Review is not intended to uncover all questionable transactions. 4Multi User licenses available in packs of 5, 10, 15, 20, 30, or 40. A maximum of 40 licensed, named users is allowed. Only the first 40 named users selected in the user maintenance screen are considered licensed, named users. 5Subject to approval and to Sage Payment Solutions terms and conditions. Additional fees, a swipe terminal for card present transactions, internet access, internet access, and credit card required. This website is owned by Computerized Business Associates. Computerized Business Associates is independent from Sage and is not authorized to make any statement, representation, or warranties or grant any license or permission on behalf of Sage regarding any product, service, or website content. Certain materials made available on or through this website are owned by Sage and cannot be used without the prior written permission of Sage. © 2019 Computerized Business all rights reserved.